If you read the (blush) introduction, you may have wondered what the heck Felix’s comment about a “rabbit hutch which became a water-bed … or did it become a Moroccan style dining room…”referred to, as well you might. The answer is: Sorry, that’s an inside joke. Truth be told, I’m Obsessive-Compulsive about repurposing because I see what isn’t there but could be (obviously a sign of mental illness), and I just have to make it so (sounds neat, but it can be a curse…trust me). It works this way: My mother threw out a solid mahogany dining room table, with a broken leg, that was otherwise in beautiful condition. I saw the good leg as a base for an end table — just add a top and some decorative edging, I thought. The table top itself materialized in my mind as a head and footboard for a freestanding day bed. And, yes, I did confiscate her trash, turning those bits and pieces into my treasures. The hutch came into being years ago, when our daughter decided she no longer wanted her waterbed because it had sprung a small leak (and waterbeds were now quite passé). I saw the piece as storage space for our large kitchen, which had very little. Out came the graph paper, pencil and eraser, and tape measure. I began designing. Oh, yes. 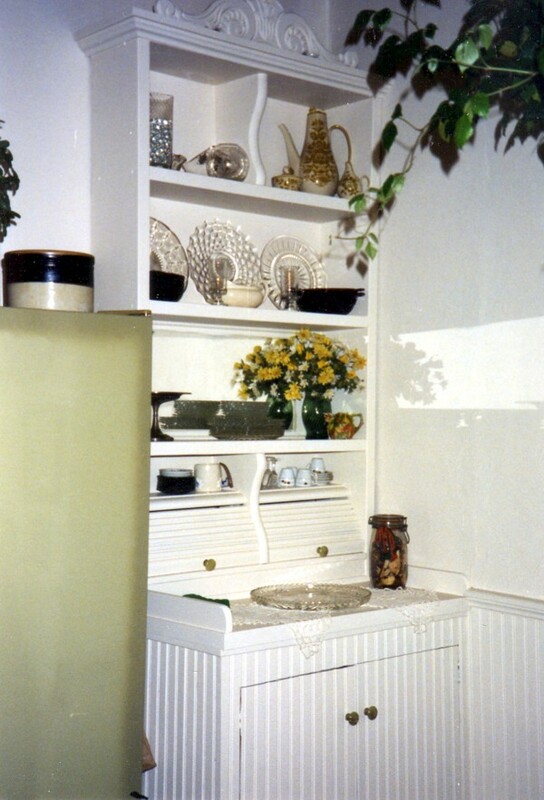 That’s a 20-something year old, very ugly, avocado refrigerator to the left of the hutch. It was there when we moved in, and it refused to die. It kept everything at the right temperature, so tossing it to the curb was not an option. I loathed it, so my next project was to disguise it with a bit of Trompe l’oeil. If you can’t beat something, do your best to outsmart it.